FRENCH & INDIAN WAR PERIOD PATTERN 1742 INFANTRY HANGER, ca. 1750: In overall near fine lightly cleaned condition. Regulation Pattern 1742, unmarked, lightly re-toned, single edged, slightly curved, 23 1/2″, cutlass-form back-blade, with a top fuller approximately 3/4 its length. Retains 55% of its polish with a lightly cleaned, smooth, re-toned, gun-metal patina. 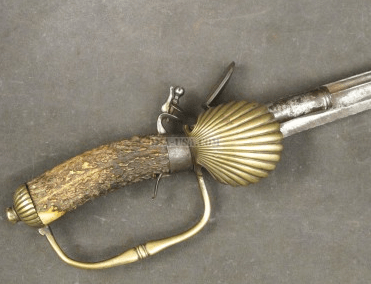 Heart-shaped, cast, brass hilt with a top-mounted quillon, a single-bar knuckle-guard and an integral rope-turned grip with ball pommel. 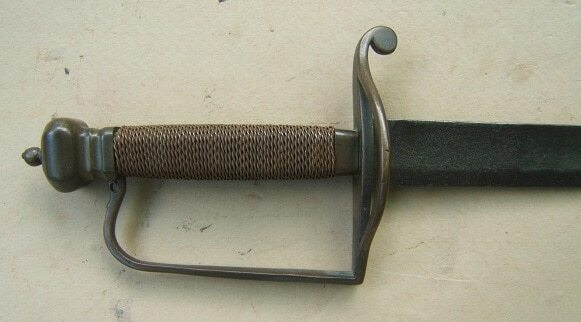 The hilt/guard In overall fine+ original condition with a lightly re-toned brass surfaces and a “C-2″ marking its face. The blade with smooth surfaces and a sharp edge: some scattered light discoloration and salt & pepper pitting. A very nice example of a Regulation Pattern 1742 French & Indian War English Infantry Hanger. Overall length 29 1/4”.